In a recent paper in the journal “Current Science”, distinguished scientist PC Kesaven and his colleague MS Swaminathan, widely regarded as the father of the Green Revolution, have argued that Bt insecticidal cotton, widely regarded as the continuation of the Green Revolution, has been a failure in India and has not provided livelihood security for mainly resource-poor, small and marginal farmers. Sharply taking on Green Revolution, the authors say, it has not been sustainable largely because of adverse environmental and social impacts, insisting on the need to move away from the simplistic output-yield paradigm that dominates much thinking. Seeking to address the concerns about local food security and sovereignty as well as on-farm and off-farm social and ecological issues associated with the Green Revolution, they argue in favour of what they call sustainable ‘Evergreen Revolution’, based on a ‘systems approach’ and ‘ecoagriculture’. Pointing out that Evergreen Revolution would guarantee equitable food security by ensuring access of rural communities to food, the authors say, there is now a need for basic research to understand the causes of ‘unintended effects’ associated with genetically engineered crops. The Green Revolution of the 1960s is biological and genebased. The height of the wheat and rice crops was genetically reduced without altering the length of the grainbearing panicle. The rationale was that these dwarf and semi-dwarf plants could uptake high levels of chemical fertilizers and water, and produce a greater number of heavy grains. Never before, not in 4000 years of wheat cultivation, had a new technology brought about such a quantum jump in yield gain and within 3–4 years. Its impact was such that India’s then image of a ‘begging bowl’ suddenly changed into a ‘bread basket’. This was a high input technology of inorganic chemical fertilizers, chemical pesticides and fungicides also requiring copious irrigation with groundwater drawn with thousands of pumps (electricity was given free). A few of these high-level fertilizer-responsive, high-yielding varieties were grown continuously over large areas displacing several locally adapted varieties and landraces (loss of biodiversity). These genetically homogeneous varieties were more susceptible to pests and diseases, with the potential for widespread failure. It was already known that chemical inputs exert deleterious effects on soil and water (the major components of the ecological foundations of sustainable agriculture). The Green Revolution (christened by the late William Gaud of the US Agency for International Development), was a farming technology. This revolution requiring high-level chemical intensification (i.e. high cost), therefore, largely excluded resource-poor small and marginal farmers. Scientific integrity demands that society is kept informed of the deficiencies and negative impacts of products of technology and innovation. ‘Intensive cultivation of land without conservation of soil fertility and soil structure would lead ultimately to the springing up of deserts. Irrigation without arrangements for drainage would result in soils getting alkaline or saline. Indiscriminate use of pesticides, fungicides and herbicides could cause adverse changes in biological balance as well as lead to an increase in the incidence of cancer and other diseases, through the toxic residues present in the grains or other edible parts. Unscientific tapping of underground water would lead to the rapid exhaustion of this wonderful capital resource left to us through ages of natural farming. Since we are at a stage of rapid advances in science and technology, it may be worthwhile discussing their impact on food and nutrition security. Only a few examples are taken up for discussion. The research programmes adopted at the MS Swaminathan Research Foundation (MSSRF), Chennai, fall under the categories of anticipatory, participatory and translational research. This is essential for ensuring that the technologies are ecologically, socially and economically sustainable. 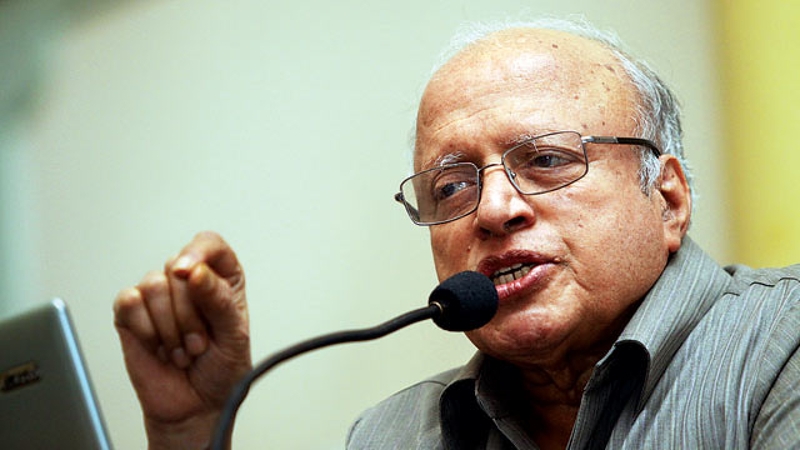 As had been foreseen and forewarned by Swaminathan, the Green Revolution started showing ‘yield fatigue’ by the late 1980s, and reached a peak decline by the mid- 1990s. By then, Swaminathan had developed strategies to transform the unsustainable Green Revolution into an Evergreen Revolution. Unlike the former, which focused mainly on the genetic modification of the plant type, the latter was designed on ‘systems approach’ to ensure concurrent attention to environmental and social dimensions as well. It is emphasized that the Green Revolution, which was not designed to fight the famine of rural livelihoods, could establish food security only at the national level, but not at the individual household level of millions of the rural poor. On the other hand, the Evergreen Revolution combined ‘ecoagriculture’ to produce food (i.e. ensuring availability of food) with ‘ecotechnologies-led ecoenterprises’ consisting of onfarm and non-farm rural livelihoods in order to enhance ‘access’ (i.e. purchasing power) of rural communities to food. Hunger in India is largely due to lack of purchasing power especially in rural areas, than a lack of availability of food. The paradigm ‘mountains of grains on one hand, and millions of hungry people on the other’ well described the national hunger paradox following the Green Revolution. The lessons learnt are that any technology, modern or traditional, ought to be eco-friendly and relevant to the weakest among the poor. It is claimed by some that hybrid Bt-cotton has led to an unprecedented increase in India’s cotton production. These claims, however, are not based on analyses by experts or authorities on cotton in India. To set the record straight, we cite two of the world’s most recognized authorities on the science and production of cotton. Keshav Kranthi (former Director of Central Institute for Cotton Research, Nagpur, and currently with the International Cotton Advisory Committee, Washington DC, USA) notes that from 2008 onwards, Bt-cotton yield stagnated at around 500 kg/ha and currently remains at this level or perhaps even lower, despite the substantial increase in area under Bt-cotton cultivation. Pest resistance to Bollgard II was already evident as early as 2008 and the onset of secondary pests became a serious concern. Kranthi concludes: ‘Bt cotton was supposed to have conferred two major benefits to cotton production: (a) high yields due to effective protection of bolls from bollworm damage and (b) reduction in insecticides recommended on bollworm control. Official data show that none of these promises was kept in the past ten years in India’. The pertinent records are available in the public domain. It is interesting that the Union of India in its counter affidavit in the Delhi High Court (in WPCC) No. 12069 of 2015, has correlated farmer suicides with the failure of Bt-cotton. At the same time, leading American cotton scientists, Gutierrez and coworkers14 have shown that farmers’ annual suicide rates in rainfed areas are directly related to increases in Bt-cotton adoption (i.e. costs). The lack of irrigation, onset of pest resistance and emergence of secondary pests necessitating application of chemical pesticides and the cost thereof, have significantly added to farmers’ woes. Growing a refuge crop delays onset of resistance. But in India ‘refuges’ are not viable given our small-holder farming. The data points conclusively to the failure of Bt-cotton due to rising resistance, the hybrid policy and secondary pests. Many cotton scientists have acknowledged the huge socio-economic cost borne by cotton farmers as a result of deploying hybrids in Bt-cotton; that it was a clever ploy for a ‘valuecapture mechanism’ by Monsanto. Its role in the failure of Bt-cotton in India and the resulting indebtedness of our farmers is significant. There is no doubt that GE Bt-cotton has failed in India: it has failed as a sustainable agriculture technology and has therefore also failed to provide livelihood security of cotton farmers who are mainly resource-poor, small and marginal farmers. That a plea has recently been made to Bt-cotton farmers to adopt the time-honoured traditional integrated pest management (IPM) system to sustain Bollgard II cotton points to the relative effectiveness of a traditional vis-à-vis modern technology. It is unethical to ask farmers to first adopt the highly expensive technology of Bt-cotton and when it subsequently failed, to then introduce an inexpensive traditional technology to protect Bollgard II cotton. Both Bt- and herbicide-tolerant (HT) crops are now proven to be unsustainable agricultural technologies. They have not decreased the need for toxic chemical pesticides, which was the reason for them in the first place.